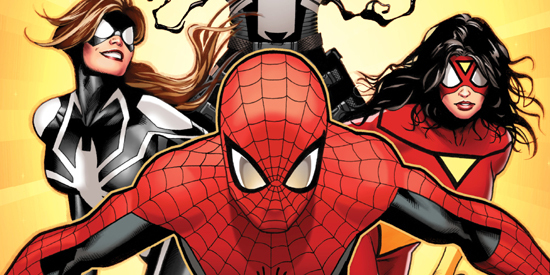 AMAZING SPIDER-MAN: SPIDER-ISLAND: TWO MIDTOWN EXCLUSIVE COVERS, AND ONE VERY COOL SIGNING EVENT! Hey there Midtown Blogadoccios, Raph here this time to let you know about some “Amazing” events going down with Spider-Man, as well as with Midtown Comics itself! Spider-Island is set to start with Amazing Spider Man issue #666, and it looks to be one of the biggest Spider-Man events in recent memory! Midtown Comics, the largest comics retailer in the world (and employers of yours truly) are having some huge things done to celebrate this new Spidey event! For starters, Midtown has not one, but TWO covers for the landmark issue! 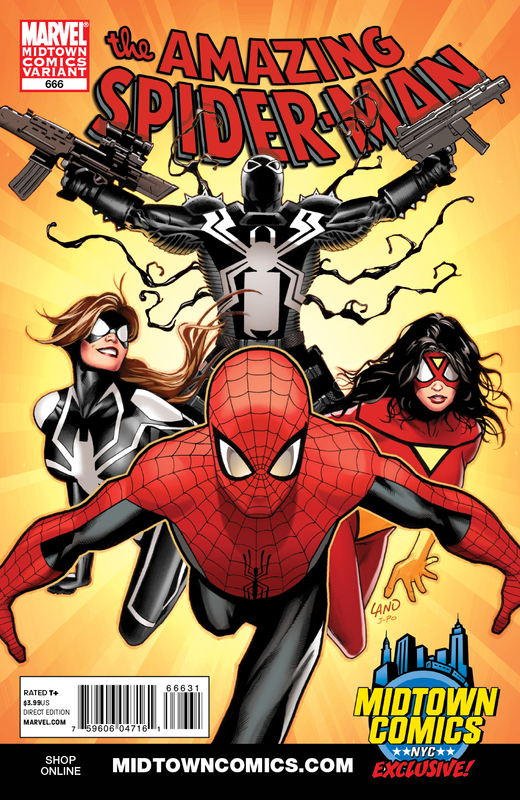 We have our very own exclusive cover by artist Greg Land, which features our favorite Webbed hero and some of his extended family: Spider-Girl, Spider-Woman and Venom! This variant is EXCLUSIVE to Midtown Comics, so the only places to find this are at our three locations (Times Square, Grand Central and Downtown), or on our website! Greg did some solid work on this cover, and if you’re in the city when it comes out, it’d make a great gift for someone who wants a New York-centric souvenir back home. The Greg Land cover will be $6.00. That’s not the only cover we have though! That’s right, we also are on the regular variant that goes out nationwide to other comic stores! Drawn by Ryan Stegman, our comic store makes headlines at the Daily Bugle as Spidey saves us from disaster! Thanks Spidey! It’s a long story, but we had a couple of laughs and he was really nice in person. The Daily Bugle cover will be $3.99. And to round it off, we’re having a signing to celebrate the release of Spider-Island, and the variants, by having writers Dan Slott, Fred Van Lente and letterer Joe Caramanga at our swank Downtown location to sign books! It’ll take place July 27th, which also happens to be the date issue #666 is coming out. Spidey won’t be able to make it, but he has been at our downtown store before. RSVP NOW ON FACEBOOK!